Monday, January 3, 2011 -- And now we head to the Southern Pacific Ocean and the remote island of Rapa Nui, also called Easter Island. Human rights are at the center of a brutal dispute taking place on Rapa Nui Island, commonly known as "Easter Island," off the coast of Chile. 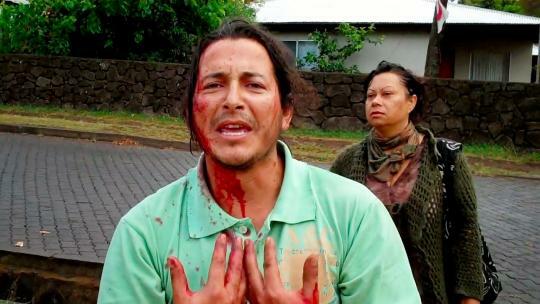 The Rapa Nui people are seeking to reclaim their ancestral lands and they are being met with violent evictions by the Chilean government. The Indian Law Resource Center has already asked for help from the Inter-American Commission on Human Rights. Leonardo Crippa, Center staff attorney, was interviewed on Cooperative.cl radio out of Chile. Crippa says the government has not responded to inquiries from the Inter-American Commission about the evictions. Click to hear the full interview in Spanish. Leonardo Crippa dijo que no han respondido al pedido de información sobre situación en Isla de Pascua. Chile tenía hasta este martes para responder por el violento desalojo del viernes, indicó.